Being a tailor we, of course, receive enquiries directly related to the work we do, but every so often we hear from individuals or organisations who are interested in other aspects of our business like our history, our many artefacts or how we work on a day-to-day basis. In the past, approaches have come from The London College of Fashion to appear in the Savile Row film Tailored Stories and from photography student Imogen Wall who wanted to take pictures of the team here at work for her final year degree project. Occasionally, we hear from TV and film production companies wanting to use our shop as a location (see our showroom in the film Bank Job). Then there was a time the team at Meyer & Mortimer (M&M) were asked to audition for a prime-time show. We did a screen-test, but we never heard back. The adage of sticking to one’s day job seems to be sage advice. Every so often, we do receive enquiries from people who are interested in some part of our history, which extends over two centuries. Our earliest records have us going into business in the late 18th Century opening our first showroom on Conduit Street, at the north end of Savile Row. Over the years, we have accumulated rather a lot of paraphernalia associated with our business. These include beautiful old prints of garments from a bygone era; our old yet framed Royal Warrants; tartan books which contain the last known examples of tartans once thought lost (more on this in future), and our ledger dating from the early 19th Century. Until recently, we believed this to be the oldest remaining M&M record until Oliver Cross, after a brave hearted clear out from under the stairs, discovered two army regulation books from the 1800s and 1900s. We published the findings on our website alongside existing information on our ledger. After seeing our ledger online, a gentleman called Steve Davies got in touch with us late last year. Steve reproduces military jackets for and is the founder of the battle re-enactment group 5/60th Rifles. In helping him to recreate his uniforms as authentically as possible, Steve is regularly on the hunt, both on and offline, for any book, journal or record that further illuminates the subject of 19th Century tailoring techniques. Doing just this, he came across our ledger and hoped it might contain information on the 5/60th Rifles. He asked if he could come down, from the West Midlands, to see and look through it in more detail. Always happy to share, we agreed, adding our caveat to anyone who happens to approach us this manner, if we are with a customer, they come first. For those not in the immediate know, the 5th Battalion. 60th was a British Army rifle regiment, also known as The King’s Royal Rifle Corps, who were active for over 200 years from 1756. They were responsible for defending the British Empire’s colonies from French and American allies. In a first for the British Army, soldiers were recruited not only from Britain but overseas too with German, Dutch and Swiss making up the ranks. In the 20th and 21st Centuries, after a series of amalgamations with other battalions and infantry units, they became The Rifles. The modern day Rifles, however, still use the 60th's motto 'Celer Et Audax' (Swift & Bold) as their current regimental motto. When not taking part in the group’s re-enactment events Steve is responsible for making the garments and he does this around a job and being in a band. He told us recently he uses reproduction broadcloth for the lower ranks and superfine cloth for the officers. Steve says ‘The jackets are made using period correct drafting and construction methods, which are compiled through the careful study of original tailors’ books and extant examples in museums and private collections’. This dedication to period construction means there is no sewing machine at hand. In his spare time, Steve hand-stitches the uniforms which take up to three weeks to complete. Not unlike Savile Row bespoke tailoring, new recruits get measured then Steve drafts a pattern unique to them. He makes a basted jacket for the first fitting, and if needed, Steve arranges a second fitting. We had to ask, do the recruits pay for the jackets? Steve informs us yes they do adding they ‘pay for their jackets themselves, and being members of the group are entitled to a group only special rate’. With this commitment to garment construction, there's a temptation to join the 5/60th purely on this basis! Switching our attention from making to the re-enactments, Steve explains the season starts at the end of March and runs through to mid-September, with around ten events throughout this period. The winter months allow the group to train, mainly in the Midlands, where they are based. In keeping with the military values they adhere to, Steve says that ‘Our day runs in the same military discipline of the original battalion. There is a formal reveille in the morning with the bugle; on to morning parade, and then arms inspection in the afternoon’. Depending on the number of groups attending, that day, there is usually time to have a skirmish or battle. So how many members does the 5/60th group have? Steve replies 'Twenty-two members in total, one of which is based in Spain. 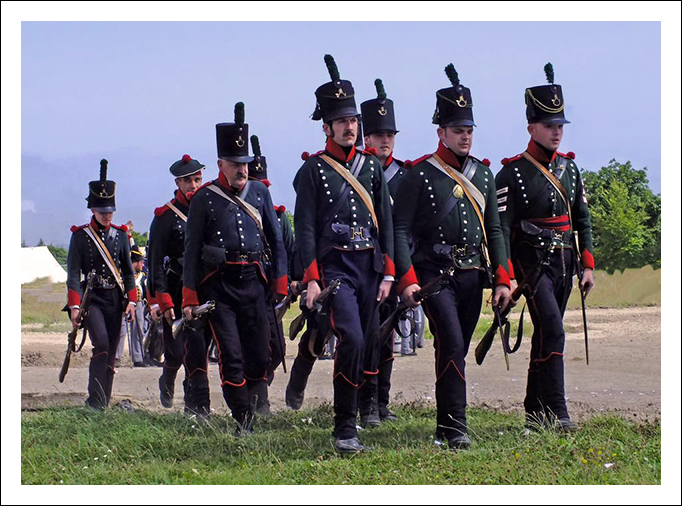 We invite our members living abroad to our events, and likewise, receive invites to attend re-enactments at the original battle sites in Spain such as Badajoz, Ciudad Rodrigo and Talavera'. As for the future of the group, Steve says the focus ‘Is to further our knowledge of the 5/60th, and, where possible, improve the quality of our kit and drill’. So what of Steve's visit to London last January? Well, he found what he was looking for: 'An order relating to the 5/60th. It listed two jackets for a Colonel Williams - one full dress and one service jacket, described as one I recently made for myself'. With Oliver Cross recently finding those two army regulation books (which are detailed tailor's notes on the construction and look of each army regiment) means we may see Mr Davies sometime again this year, which he is more than welcome. If you would like to see the 5/60th in action, please visit their website for details and dates or follow them on Facebook or Twitter.